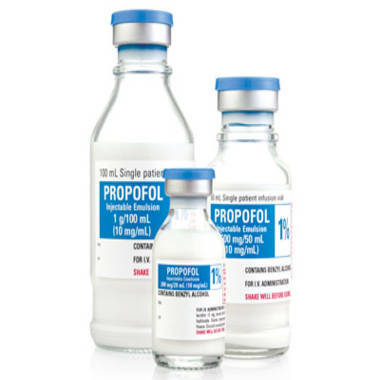 Propofol, a powerful and widely used anesthetic is among many drugs still in short supply, although experts say the situation is improving. America’s drug shortage crisis appears to be easing, with a big drop in new reports of vital medications in short supply, including those used to treat cancer and other illnesses. At the same time, though, ongoing shortages of drugs used for basic care -- think propofol for anesthesia and morphine for pain relief -- aren't going away, according to experts tracking the problem. “Because many shortages are due to significant manufacturing problems, it's taking longer for some shortages to resolve," said Erin Fox, manager of the Drug Information Service at the University of Utah, which monitors the issue. As of Aug. 31, there were 123 reports of new drug shortages this year, which is about a third lower than those logged for about the same period in 2011. Last year was a record year for drug shortages in the U.S., with 267 drugs in short supply. Reports of active shortages were down by less, 14 percent between 2011 and 2012. There were 211 reports of active shortages in the second quarter of 2012, down from 246 reports of ongoing shortages for the same period last year. Some of the drugs on the list, such as the amphetamine mixed salts used to treat ADHD or attention-deficit and hyperactivity disorder, have been on the list for a year or more. New rules requiring drugmakers to notify the Food and Drug Administration sooner about pending supply problems are largely responsible for the declines in both areas, said Fox. After an executive order last year and then passage of the FDA Safety and Innovation Act, or FDASIA, which was signed into law in July, reports of looming problems with drugs have soared, said Valerie Jensen, associate director of the agency’s drug shortage program. Last fall, after President Barack Obama issued an executive order urging drugmakers to report problems earlier, FDA estimated that reports jumped six-fold and Jensen said they’ve only continued to rise. “Our inbox and our voice box are overflowing,” said Jensen, who had no firm estimates of the number of new reports. They’ve allowed the FDA to intervene earlier and help ease or avert shortages, such as when drugmaker Hospira discovered earlier this year that it had overfilled some syringes of 15 widely-used drugs, including narcotics, increasing the potential for overdose. But instead of pulling every other potentially suspect lot, contributing to ongoing drug shortages, the FDA worked with the firm, allowing Hospira to issue warning letters with the packages advising health care providers about the potential problem. Some issues, however, aren’t so easily resolved. Manufacturing problems, including those that affect drug safety, are now responsible for more than half of all shortages, Jensen said. Raw material supplies, increased demands and other issues also lead to shortages. “The trouble is that the problems are longer-lasting,” Jensen said. In a dozen cases over the past two years, the problems in the U.S. have been so intractable that the FDA has resorted to importing vital drugs from foreign suppliers. That was largely responsible for resolving shortages of certain chemotherapy drugs used to treat cancer, Fox said. In February, for instance, the FDA approved import of the drug Lipodox from an Indian manufacturer, Sun Pharma Global. Patients like Maggie Heim, 59, of Hermosa Beach, Calif., are pleased that the shortage situation is improving, even as they struggle with the damage already done. Heim faced a second recurrence of ovarian cancer this spring, six months after she was denied Doxil because of shortages. “Yes, I am getting treatments now, but the harm from not getting it last summer may already have occurred,” she said.